We love this! 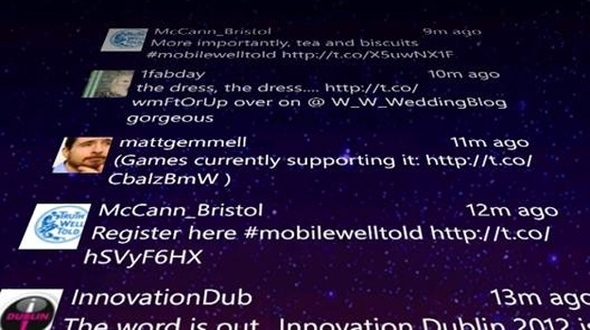 This week saw the launch of a new mobile app from Microsoft taking social networking on smartphones into a new stratosphere, by allowing fans of one of the world’s most iconic film franchises to view their Facebook and Twitter feeds in the style of ‘the crawl’, the iconic STAR WARS™ opening title sequence. Free to download on Windows Phones, iOS and Android mobile operating systems, the new app helps mark the recent release of “Kinect Star Wars”, the latest game from Xbox 360 that harnesses the Kinect’s controller-free, motion-tracking technology to enable players to truly fight like a Jedi. Synching with Facebook and Twitter accounts, the app transforms smartphones into the ultimate social media dashboards by aggregating social media streams into one place.